The dishes of Portugal are known for being mild in spice but rich in flavor. Meals such as stewed seafood flavored with herbs and vinegar, homestyle bread made with sweet potato, rich sausage stews, ribs sweetened with pepper paste-all food Ana Patuleia Ortins has eaten growing up as a first generation descendant of Portuguese immigrants, as well as taught in her Portuguese cooking classes. This masterful collection of more than 185 recipes has it all: Classic, must-have favorites that preserve the traditional flavors of Portugal, and recipes inspired by modern Portuguese cuisine. This is the biggest and most comprehensive book on Portuguese cooking that will thrill foodies from anywhere. With recipes such as Madeiran Wine and Garlic Beef Kabobs, Mushroom-Stuffed Pork Tenderloin with Pomegranate Sauce, Sauteed Kale with Pine Nuts and Onions, and Saint Martin's Grilled Salt Cod with Potatoes, there's something for everyone. Your family and friends will be talking for days about the incredible dishes you've created from this book. Hardcover, 400 pages. 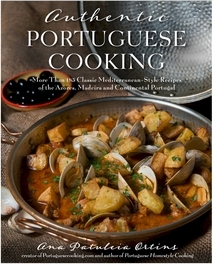 Ana Patuleia Ortins is the author of Portuguese Homestyle Cooking. She is a first generation descendant of Portuguese immigrants from the small town of Galveias in the Alto Alentenjo province of Portugal, and teaches classes on Portuguese cooking. She lives in Peabody, Massachusetts.